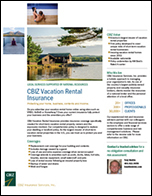 CBIZ Vacation Rental Insurance, a CBIZ, Inc. business, is the largest insurer of short-term vacation rental properties in the United States. We are the first broker to develop specific policy coverage to meet the needs for vacation home rental properties and the amenities offered by these businesses. We have insured vacation rental properties since 2002. Our policy is offered to owners who advertise their vacation rental home online using sites such as VRBO or AirBNB, or use a property management company. Available throughout the United States! The CBIZ team is knowledgeable about all aspects of insurance, specifically the exposures related to short-term vacation rentals. As specialists in the industry, we leverage our knowledge and passion to ensure you and your business are adequately protected.